WASHINGTON, D.C. – Former Rep. John Dingell, the longest serving member of Congress, died Thursday, Feb. 7. During his 59-year tenure in the House of Representatives, Dingell was the longest serving member of the Migratory Bird Conservation Commission (MBCC) with 45 years of service. The Congressman was intimately involved in the North American Wetlands Conservation Act (NAWCA), one of the most successful efforts dedicated to waterfowl and wetland habitat conservation and a key program for implementing the North American Waterfowl Management Plan. Established in 1989, NAWCA provides federal cost-share funding to support the North American Waterfowl Management Plan, an international agreement that provides for the long-term protection of wetlands and associated uplands habitats needed by waterfowl and other migratory birds in North America. NAWCA has helped fund more than 2,833 projects on almost 29.8 million acres in all 50 states, areas of Canada and Mexico. More than 6,000 partners, including private landowners, industry and state governments have worked together to conserve wildlife habitat through NAWCA grants. 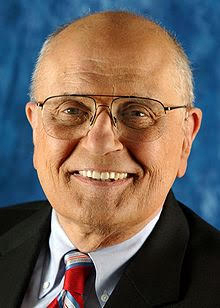 Congressman Dingell was instrumental in establishing the Detroit River International Wildlife Refuge, which includes parts of Michigan, Ohio and Ontario. DU testified in support of the refuge and partnered with the U.S. Fish and Wildlife Service to improve and expand wetlands in the refuge. For more information, visit ducks.org. Ducks Unlimited Inc. is the world's largest nonprofit organization dedicated to conserving North America's continually disappearing waterfowl habitats. Established in 1937, Ducks Unlimited has conserved more than 14 million acres thanks to contributions from more than a million supporters across the continent. Guided by science and dedicated to program efficiency, DU works toward the vision of wetlands sufficient to fill the skies with waterfowl today, tomorrow and forever. For more information on our work, visit www.ducks.org.